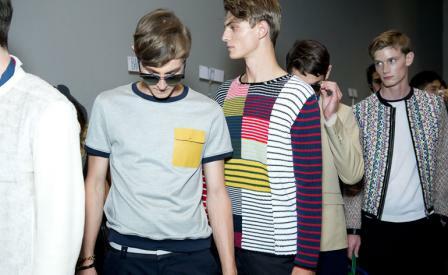 It's been several seasons now that Fendi has been fine-tuning its menswear collection. Now that it's properly featured on the runway, the company is pushing wearable, not wacky fashion, based on casual separates that are all easy pieces for a man to mix and match. Standouts included cleanly cut square jackets in spotless leather or cloudy denim, jersey T-shirts with leather pockets, suede baseball jackets, chinos and navy tapered trousers. Very little of it was destined for the office - in fact, the few tie-less suits that materialised were all shown with leather strap poolside sandals and cross body bags. But Fendi is first and foremost an accessories company, so the neutrally toned clothes did a great job of providing a clean canvas from which the exciting extras could pop. Our favourites included a fluffy mohair backpack and the brand's signature Peek-a-boo bag in egg yolk yellow.